"Barn with Forest near Astoria, Oregon"
Found off the highway on the way to Astoria, Oregon. The grass in the forground was a very dark green and the sky was washed out white (by visible light). I like the way the sky almost always darkens with IR. I'm trying to understand why the trees that are farther away photographed darker (?). 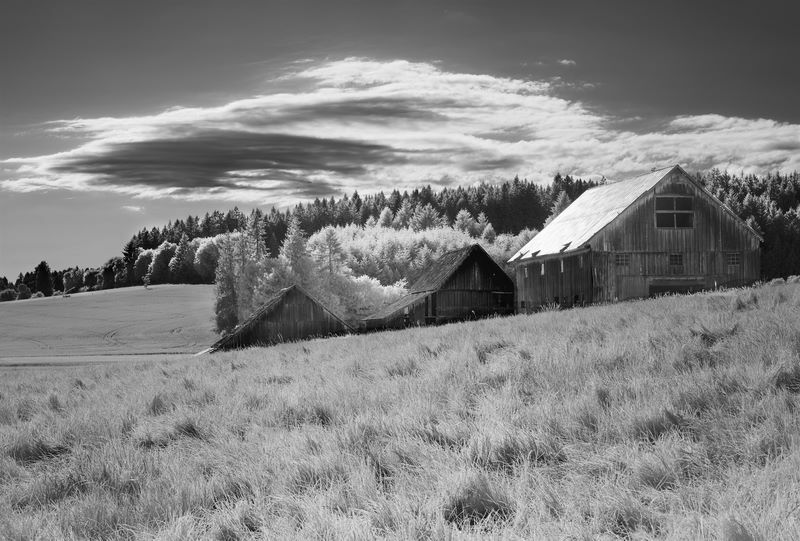 Tech Info: Digital Infrared Photography Taken with the Betterlight Digital scanning back with (portability option) in a Linhof Technika 4x5, 180 apo rodenstock lens, 16bit approx 250 meg file. Copyright Tim A Fleming all rights reserved.